It's about life, not limitations. All of us want to enjoy a rich, full existence. Some of us need help to make it happen. That’s what The Enrichment Center is all about — empowering adults with intellectual and developmental disabilities to live their best life. The Enrichment Center helps adults with intellectual and developmental disabilities reach their full potential and achieve their best life. Through art classes, life skills training, community activities and job placement, individuals build on their abilities and connect to the broader community. These efforts enrich their lives, and the life of our community through their inclusion. Our mission is to empower and enrich adults with intellectual and developmental disabilities, enabling them to grow as individuals, live with dignity and have choices in how they fulfill their lives. We live out our mission by offering a variety of programs that allow individuals to earn a living, be recognized for their artistic talent, and live as independently as they wish to live. The Enrichment Center is a partner agency of the United Way of Forsyth County. 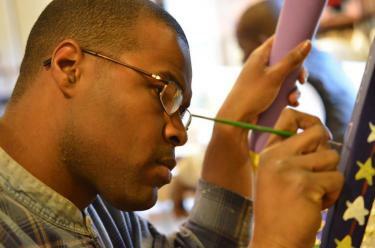 The Enrichment Center is a member of the Arts Council of Winston-Salem and Forsyth County. The Enrichment Center is an affiliated chapter of The Arc and The Arc of North Carolina. The Enrichment Center is accredited by CARF International.